Boasting an early warning system, night watch mode and simply functioning as an effective protection against fire, the 2nd generation of the Nest Protect is equipped with a fire intensity detector, meaning it can differentiate between a smouldering fire and a burning blaze, alerting you accordingly. This device also functions as a reliable Carbon Monoxide detector. Nest has given this second generation even more features beyond the conventional smoke/carbon monoxide combo. A special steam detector can identify whether there really is danger present, or if you've just burnt your toast. The built in carbon monoxide detectors have a lifespan of up to 10 years, meaning you can rest assured that it's always on the lookout for this silent killer. The detector is controlled through an App, which delivers you with notifications on your smartphone about any potential issues. The Nest Protect + Google Home Hub will be a fantastic addition to any home, keeping you and your loved ones safe. The Nest Protect is a smoke and carbon monoxide detector giving you both vocal and smartphone notifications if it senses something isn’t right. Its built to last up to a decade, and includes a Split Spectrum Sensor that tests itself automatically. The added Google Home Hub will connect with the Nest Protect to keep you up to date on whats happening around your home. The Nest Protect and Google Home Hub bundle will keep your home safe while make sure you stay alerted and in control. The Nest Protect will really benefit anyone who purchases it, as its main functions are to detect smoke and carbon monoxide to keep you protected from unforeseen mishaps. Internally, its smart features stretch far and wide to give you intelligent ways of receiving notifications and alerts. The added Google Home Hub is compatible partner, but also a powerful voice-assistant that offers a wide spectrum of its own features. All in all, this package is a smart powerhouse that will ensure upmost safety. 400 self tests per day:The Nest Protect optimizes reliability, performing 400 self tests per day to ensure its always ready. If not, the Nest Protect will notify via app so you can fix the problem right away. Smoke and carbon monoxide detector:What sets the Nest Protect apart from other traditional smoke detectors is its ability to detect carbon monoxide. This is a tasteless, odorless gas that people aren’t always aware of but has been linked to a number of health problems. App Control:Always stay up to date and in control in the Nest app. If anything is sensed, you’ll get a notification on your phone. If the alarm does go off but you have control over the situation, you can silence the alarm from your phone. Built-in night light: A built-in motion sensor helps to guide you through your home at night. As soon as you step underneath a Nest Protect, its LED Ring lights up white. An additional daylight sensor disables this function during the daytime. Smart alerts you can see: The added Google Home Hub will connect to your Nest Protect so you will receive alerts and via a local device. However, as a stand-alone product, the Google Home Home has a plethora of smart features all of which you can see visually on its beautiful 7" LCD touchscreen. The Nest Protect and Google Home Hub bundle provides your home with smart detection and alerting, assuring your home stays safe. It detects both smoke and carbon monoxide and will alert your smartphone if anything unusual is detected. 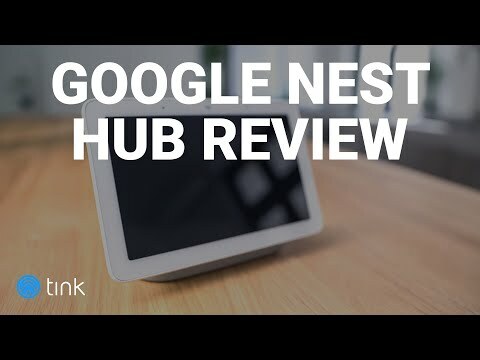 The Google Home Hub is a fantastic addition as it is compatible with Nest and gives you another alerting method while being a powerful voice assistant. You might be thinking what really makes the Nest Protect so much different than other smoke detectors besides its dual sensing capabilities? Well, the Nest protect has an abundance of underlying smart features that put it in a class of its own. For starters, the smart detector is able to detect the intensity of a fire (whether it poses a serious threat or not). Either way, you will be notified in the app so you can take care of the situation. The Nest Protect has a nightly promise, so when you turn off all the lights at night it will glow green, meaning the Protect tests itself and there won’t be any unexpected chirps or squeaks. When you then walk under the protect during night, it will light your way with a path light. It can also illuminate red or yellow when it recognizes something is wrong and the level of threat, offering a local visual alert. In addition, if it just detects some burning popcorn, instead of sounding the 85 dB alarm (which it does when heavy smoke is detected) a friendly vocal alert will let you know something is going on in the kitchen. The included Google Home Hub is not something that should be overlooked. Not only is it compatible with the Nest Protect but it has a range of its own smart features that will make your daily life easier and more efficient. This powerful voice assistant comes with a 7” touchscreen display so you get information you can see. Call up directions or make use of video recipes directly on the screen. You'll also get a smart speaker for playing your favorite music - stream from popular services like Spotify, TuneIn or Pandora. A slightly tricky set up – those who aren’t good with their hands may want to enlist the help of a friend. Have no fear, you should be finished setting it up within an hour or so. In terms of bang for your buck, Nest have spoiled us when it comes the number of sensors on board. The Nest Protect can detect smoke, carbon monoxide, light, motion and steam. The Nest App does a great a job of making its variety of features accessible. The bare-bones is great for people who are new to app-based devices. The Google Home app is also super user-friendly and provides great control. Three dual smoke and carbon monoxide detector and additional smart features such as home/away assists, self-testing, and vocal alerts. The Google Home Hub is no different, packed with smart features that all are accessible through a 7" LCD touchscreen. The combination of the early-warning system and app-based alerts make this one of the most reliable detectors out there. Its 10 year lifespan is also relieving. An ultra-clean design that simply looks great, working well no matter what room it’s in. The Google Home Hub's 7" touchscreen is a real standout. The connection over Wi-Fi is encrypted according to the 802.11 b/g/n standard. Google is committed to keeping your home life private - the Home Hub only listen to what's going on when the wake word "Hey Google" has been spoken. This bundle is all about safety and for this price it doesn't get much better as you are getting some of the most thorough and diligent home detection. How do I change the batteries in the Nest Protect? Simply take the Nest Protect off of the ceiling and open the hatch on rear side of the device. What certifications does the Nest Protect have? The Nest Protect has been tested by Underwriters Laboratories for compliance with U.S, European and Canadian safety standards. Which devices is the Google Home Hub's app compatible with? The Google Home App is compatible with Android 5.0 (or higher) and iOS 10 (or higher) devices.